ST. PETERS–UNICEF St. Maarten in collaboration with the Ministry of Education, Culture, Youth and Sports (ECYS) hosted a special ceremony on October 19 to symbolically hand over a one-time donation of materials as part of the recovery of fourteen afterschool programmes in the country. 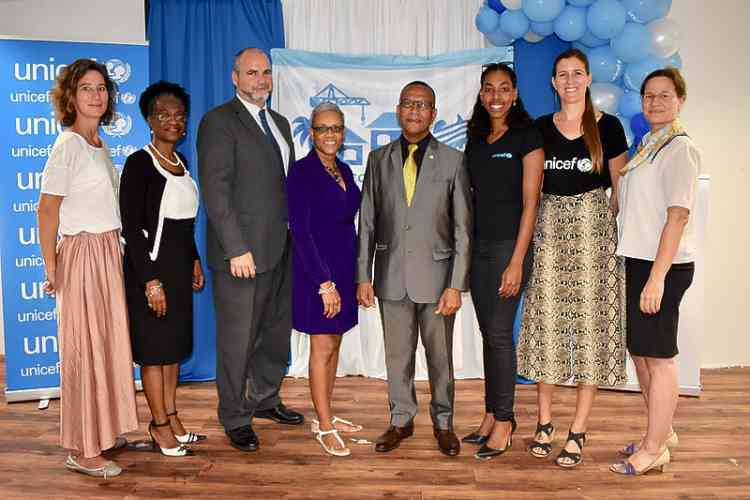 The afterschool programmes were thanked during the ceremony for their continued work with the youth, with emphasis put on their role in supporting the community after Hurricane Irma. To assist the after-school programmes in their efforts, a variety of materials were donated to each programme as part of UNICEF’s after-school programme mapping and support activity. The material donated included art supplies, sports equipment, reading books, language books, writing materials, toys, musical instruments, educational games, playground equipment and more. “I am honoured to be here to give thanks to the afterschool programmes for their continued efforts in educating, encouraging and inspiring our youth,” said ECYS Minister Wycliffe Smith, who attended the ceremony and praised the afterschool programmes during his speech. Dutch Representation Office in St. Maarten VNP head Chris Johnson mentioned his own children and the various levels of trauma they had experienced after Hurricane Irma. “Afterschool programmes play an important part in helping our kids bounce back from a disaster such as Irma. On behalf of the Dutch government I say, ‘Thank you,’” Johnson said. “UNICEF went above and beyond with providing us the materials we needed. We were allowed to fill out a wish-list of items and received just that. The donated materials will be put to good use,” Belvedere Community Foundation representative Jessica Richardson-Lake said on behalf of the recipient afterschool programmes. The afterschool programme mapping and support project is one of the early recovery projects financed from the Dutch Recovery Fund for St. Maarten, under the auspices of the Ministry of the Home Affairs and Kingdom Relations. Amazon donated a large portion of the materials donated. “We are very grateful to have received support from the Ministry of ECYS, the Dutch Recovery Fund and Amazon for this project activity. Afterschool programmes can boost academic performance, reduce risky behaviours, promote physical health and provide a safe, structured environment for the children of working parents. They are very important to our community and UNICEF is happy that we could support them in this way,” UNICEF Community Mobiliser Suzette Moses-Burton said.